There are two types of polymers: synthetic and natural. Synthetic polymers are derived from petroleum oil, and made by scientists and engineers. Examples of synthetic polymers include nylon, polyethylene, polyester, Teflon, and epoxy. Natural polymers occur in nature and can be extracted. They are often water-based. Examples of naturally occurring polymers are silk, wool, DNA, cellulose and proteins. In our previous section on network polymers, we mentioned vulcanized rubber and pectin. Vulcanized rubber is a synthetic (man-made) polymer, while pectin is an example of a natural polymer. Rubber can be found in nature and harvested as a latex (milky liquid) from several types of trees. Natural rubber coming from tree latex is essentially a polymer made from isoprene units with a small percentage of impurities in it. Rubber can also be made (synthesized) by man. Synthetic rubber can be made from the polymerization of a variety of monomers, including isoprene. Natural rubber does not handle easily (it's sticky), nor does it have very good properties or durability (it rots). It is usually vulcanized, a process by which the rubber is heated in the presence of Sulfur, to improve its resilience, elasticity and durability. Synthetic rubber is preferable because different monomers can be mixed in various proportions resulting in a wide range of physical, mechanical, and chemical properties. The monomers can be produced pure and addition of impurities or additives can be controlled by design to give optimal properties. Vulcanization, also called curing, is the chemical process used in the rubber industry in which individual polyisoprene chains are linked to other polyisoprene chains by chemical bonds (see reaction sequence below). 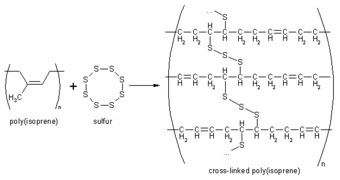 The actual chemical cross-linking is usually done with Sulfur, but there are other technologies that can also be used. Vulcanization is an irreversible process, like baking a cake. The normally soft and springy rubber molecules become locked together resulting in a harder material with greater durability and chemical resistance. Vulcanization changes the surface of the material from very sticky to a smooth, soft surface which does not adhere to metal or plastic substrates. Pectin is a long chain polymer composed of pectic acid and pectinic acid molecules (see structure below). Because these acids are sugars, pectin is called a polysaccharide. It is obtained from citrus peels and the remains of apples. In the plant/fruit, pectin is the material that joins the plant cells together. The pectin chains form a network because some of the segments of the pectin chains join together by crystallization to form a three-dimensional network in which water, sugar and other materials are held. Formation of a gel is caused by physical or chemical changes that tend to decrease the solubility of the pectin and this favors the formation of small localized crystals. The most important factor which influences pectin's tendency to gel is temperature. When cooling a hot solution containing pectin, the movement of the molecules is decreased and their tendency to combine into a gel network is increased. This ability makes pectin a good thickener for many food products, like jellies and jams. If there is sufficient sugar in the mixture, pectin forms a firm gel.